This summer I took some time to work on a project by an old friend from film school, Ryan Bennett. He has had a feature film in development for the last few years and this summer was the time for it’s birth. “Ramblin’ ‘Round” was shot on S16mm with the Arri 16 SR3, mostly on Kodak 7207 – 250D, in and around Dexter, Maine. I was 1st AC and slept in a room with a hole where a window should have been. You can see here, it was covered over with red fabric giving my bedroom that prostitute-at-work aesthetic. Fortunately, this also made it easy to gain entry to the house on the numerous occasions when we found ourselves locked out. Now, shooting on Super 16 in rural Maine in the summer can render you with a fridge full of fantastic images of epic locations, but it also means you don’t get dailies because the lab is not exactly on the way home. 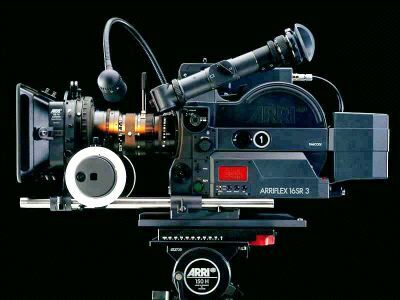 Unfortunate to say, but the video tap on the Arri SR3 consistently let us down, forcing us to do things the old fashioned way. To say that the gear had seen some action was an understatement, most of it still bore the marks of West Germany. Also, we took it through some pretty tough locations. At one point we acquired a drum kit and a guitar amp (by class act, First Act!) which boosted moral into the stratosphere. Well, at least for a few peoples. It was a pretty damn good time. Here’s an article in Hollywood East Connection about the project. All things must pass and in this case those things were mostly time and money. We shot all we could given that cast & crew had other commitments after 4 weeks. The majority of the film is complete, though it will take another summer to finish shooting the remaining scenes. Processing was done at Deluxe and dailies were done at Company 3 in NY and we have since had the opportunity to watch them. The footage looks fantastic and is currently being cut into a teaser. Brilliant, love the run down. If you had to estimate how many energy drinks were consumed during that month, what would you say? also, I feel like the “camera crew” pic is a little off. I was sure there were 4 people in that crew was there not? There is some evidence, as depicted above in photograph #1 of “in knee-deep water”, that there was in fact an additional tribesman assisting with the maintenance of the camera equipment leading some to postulate a 4th camera team member theory in spite of written records to the contrary, however this apparent discrepancy is cleared up in the photograph immediately following where it is clearly seen that the additional tribesman is nowhere to be found and is in fact not necessary for the functioning of the camera gear. Some have pointed out that in this second image there is also a distinct lack of the 3rd camera team member who is known to have existed during this same time period. This has led some to the now controversial, “They were probably scared of the leeches in the water, which were actually really small and made them look like little girls” theory. Further photographic data will hopefully resolve this debate.